With stores moving away from using plastic bags, fabric tote bags are becoming an essential item to bring with you if you want to go shopping. Cotton tote bags can often be bought for just a few dollars, and most people have a few extra around the house. Instead of using your bland blank tote bag, update it to be the perfect stylish bag for grocery shopping, carrying your lunch to work, or holding reading materials for the bus. Handmade tote bags also make for a great way to wrap presents for parties or as an inexpensive but thoughtful thank you present that you can customize. At least one of these do-it-yourself tote bag ideas are sure to inspire you to stamp, stencil, silkscreen, or iron-on transfer yourself a new tote bag. This easy DIY upgrades a basic canvas tote into a beautiful piece of art! All you need is a little paint and some creativity to design a one-of-a-kind bag that you can carry from the gym to the store. This easy felt tote is great for beginner sewers and even kids! 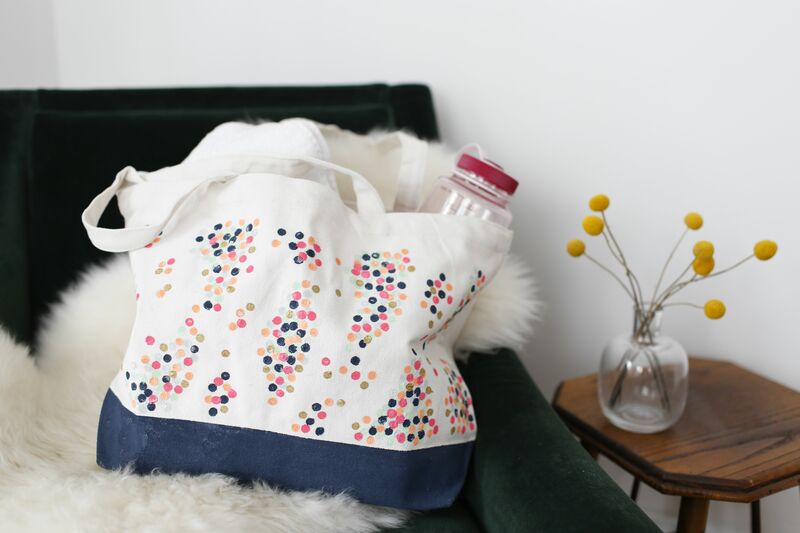 We love this project idea for a kids' crafting party and the casual fabric makes it a great stylish gym bag. This colorful tote is not only super cute–it's super functional! The stripes serve as pockets so you can tuck away your most necessary accessories. This is the perfect beach or gym bag! Head to the kitchen and grab some freezer paper to make your own heart target stencil so that you can create your own tote bag as demonstrated by Lovely Indeed. Make your own nautical themed anchor tote as DIYed by Lost In The Haze. The simple blue and white bag would be perfect at the beach, or to show off your love all water and best of all it is easy to make too as all you need is a piece of cardboard to create your own stamp, some paint, and a blank tote bag. 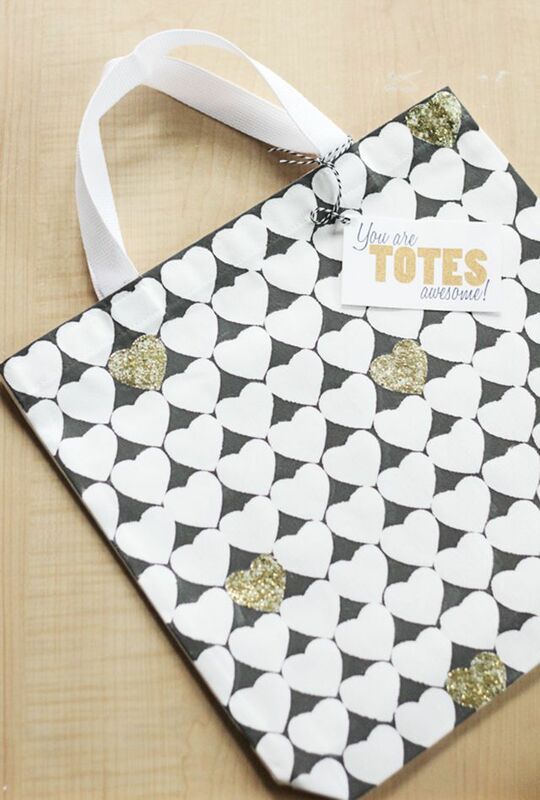 Using iron on foil for the cute gold heart Craftaholics Anonymous shows how to make a trendy metallic tote bag. If you are feeling especially crafty they also show how to sew your own tote bag using burlap. Using Martha Stewart silk screen kit for the word "bride", and freehand painted brush strokes at the top and bottom, Something Turquoise crafted this colorful bride tote bag that is so cute that we are certain the bridesmaids will want their own bag too. This neon dots tote bag would be perfect for the kids to help make as it is so simple to do. To get started all you need is some neon fabric paint, a tote bag, and the end of a pencil's eraser to use as a stamp. To get all the do it yourself instructions visit Say Yes. Stamp your way to a new geometric tote bag. Mad In Crafts demonstrates how easy it is to create your own stamp by using a piece of foam to create this green, pink and gold triangle stamped tote bag. Head over to How About Orange and download the Look On The Bright Side iron on transfer template which you can print using your home printer onto a sheet of iron on transfer paper. Simply place printed paper onto your blank tote bag and use the heat of the iron to transfer the image. Show your romantic side with this painted hearts tote bag by Crafts Unleashed, that is made by blocking off hearts and painting the spaces between the hearts with black paint. To add a bit of extra flair some of the hearts are painted with gold glitter. Make these adorable pastel hued iron-on transfer popsicle tote bags to use at your child's next birthday party as loot bags to give to guests or as a gift bag. Creature Comforts provides not only the step-by-step guide on how to create your own popsicle tote but the free iron on transfer template, and matching popsicle gift tags and banners for your next party!